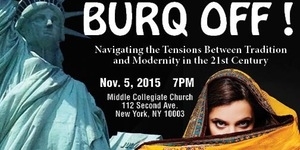 Nadia will perform an excerpt from Burq Off! and speak about gender expression in traditional culture. Watch the full video now! Shugs & Fats at Miami Film Fest! 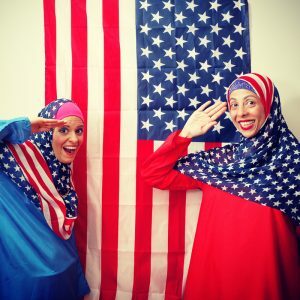 Radhika and Nadia will be chatting about using comedy to bust stereotypes at a panel on March 5th. Join us for Laughing Instead of Crying, we've got to combat this insanity in every possible way. Burq Off! is going to South Korea! Burq Off! will be presented as part of the Seoul Theater Bomb Festival in South Korea! Performances will be at 8pm on November 23-26. We can't wait to share this show with the audiences in Seoul. 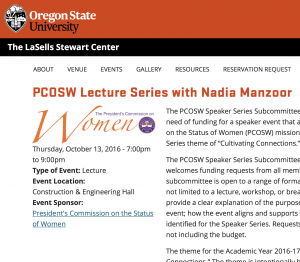 Nadia Manzoor was featured as the kick off speaker in Oregon State University's President’s Commission on the Status of Women Speaker Series. 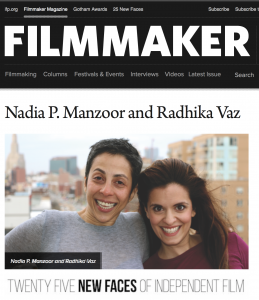 Nadia and Radhika were named in Filmmaker Magazine's 25 New Faces of Independent Film 2016 and were noted as 'audience favorites' for their Tacoma FIlm Fest Shugs & Fats screening. 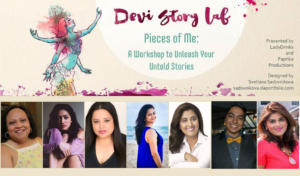 The Devi Story Lab is a series of workshops that will empower you to find your voice, create a community of spirited women, and bring to life an evening of unique stories and experiences. Everyone has a story. Many South Asian women have faced resistance. from their families, communities, cultures, and thus have not had the opportunities to speak their truths and tell their stories. Instead they’ve kept them hidden. This 10 week workshop aims to break that cycle of shame. 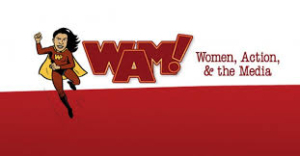 Over the course of the class, the all female participants will discover their stories and how to tell them. Through improvisation, writing exercises, personalized coaching and peer support, each woman will be nurtured in owning her story. The workshop culminates in a public performance in which all participants have the opportunity to share their stories with the support of professional producers, theater directors, and designers. 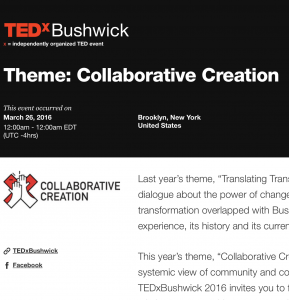 Nadia Speaks at TEDx Bushwick! Nadia shares her story of growing up a cultural yoyo on the TEDx stage. In her speech she recounts how ​collaborative creation and ​speaking her truth encouraged her to accept conflicted identity and challenge the status quo. Watch the full video now! 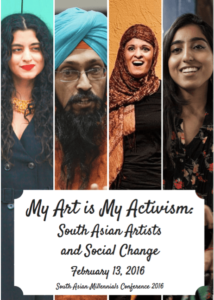 The South Asian Millennials Conference presents a night of performance, gallery exhibition, and conversation with leading South Asian artists from around the world and how they conceptualize their activism through their various art forms. 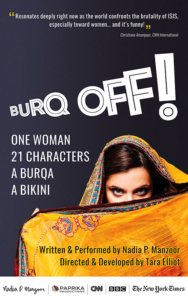 Nadia Manzoor performed an excerpt of Burq off! followed by panel. 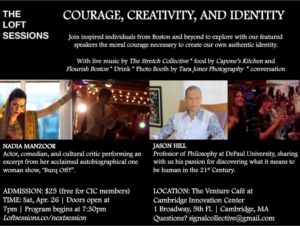 Intersections International is hosting this cultural event where I’ll be performing a 20 minute excerpt from BURQ OFF!, following by an interactive panel discussion with author and activist Irshad Manji and financier Riaz Siddiqi. Together, we’ll explore how the issues I faced growing up symbolize the misunderstandings and tensions between the US and Pakistan. A panel discussion about identity, both inside and out. 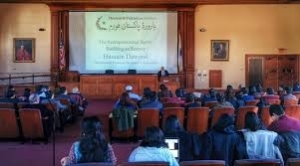 Featuring Nadia P. Manzoor, Sheheem Abbas, Yomi Abiola, Heather Schultz, and Pamela Prather. This event is free and open to the public. Please be advised that space may be limited. Nadia presented on a panel titled Osmosis Navigating Private & Public Spaces. 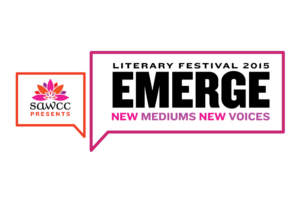 A two day interdisciplinary literary festival featuring screenwriters, memoirists and journalists who challenge the boundaries and contexts of the written word. 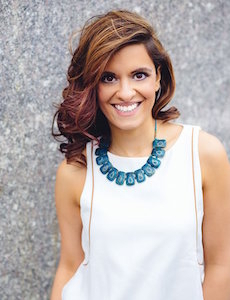 Nadia lead her signature memoir writing workshop, Stories that Breathe: Finding the Story You Were Meant to Tell. Nadia spoke on The Role of Arts and Literature in a Future Pakistan Panel with fellow artists, musicians, journalists, writers, and cultural influencers. 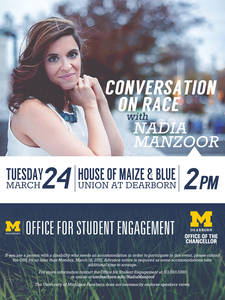 Nadia spoke about her understanding of identity and engaged the audience by asking the question: do we understand identity from the outside in, or from the inside out? Nadia presented on a panel focusing on the role of arts in activism with feminist writers, thinkers, and performers. 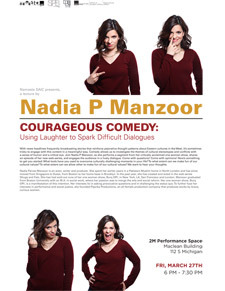 Nadia performed an excerpt from her solo show and facilitated a conversation about the moral courage necessary to create our own authentic identity.